The French started the work in 1881 headed by the man who built the Suez Canal in Egypt. But after nine years of work, they quit because of engineering problems and high mortality due to disease (malaria). A few years later the United States took over the project. With new information on where malaria comes from (mosquitoes) and how its spread, the Americans were able to be more successful. They set forth a massive sanitation project by fumigating, putting screens on windows, cutting down grass and paving roads, introduced mosquito nets and got rid of standing water. These are all obvious things we know today, but the French knew none of this and disease killed so many people, including all the nurses, that when the Americans came they knew attacking the disease needed to be dealt with first before they could bring any workers in to continue on with the Canal. The French completed the first third of the Canal and the Americans finished the rest in 10 years. The Panama Canal allowed ships to save 8 days of transit time by not having to sail around Cape Horn, the southernmost tip of South America. 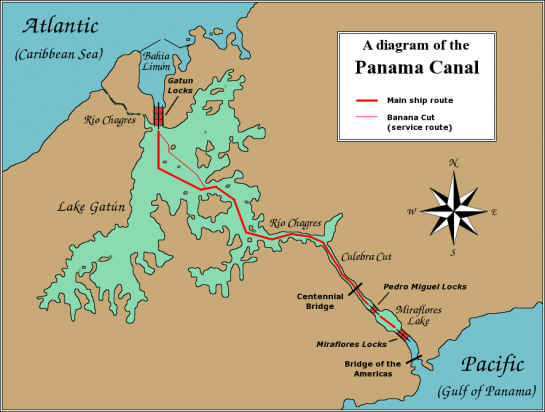 In 1999 the operation of the Canal was transferred from the US to Panama. 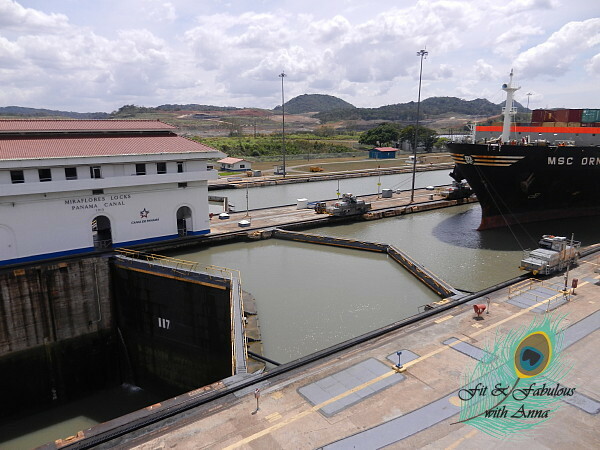 A ship does not "sail" through the Canal, it passes through a series of locks, twice (the Gatun locks and the Miraflores locks) and a ship must be “Panamax” size to fit through the Canal. If they can not then they can use a taxi system of sorts where their containers are removed from the ship and taxied across the Canal and picked up by another ship on the other side. A tug locomotive is used to help a ship stay centered within the Canal. I saw one ship pass through with only 22 inches between the ship and the wall of the locks! The Canal operates faster than your bathtub, 100 holes pump water into the lock with fresh water (salt water would erode the Canal) and the whole process only takes 8 minutes! The Canal has two-way traffic, on each side. A ship has to wait 24-48 hours in queue to pass through the Canal so I saw tons of ships just sitting around the lake. They are now widening and modernizing the Canal (as container ships are getting larger) with two new sets of locks being built parallel to the old locks. 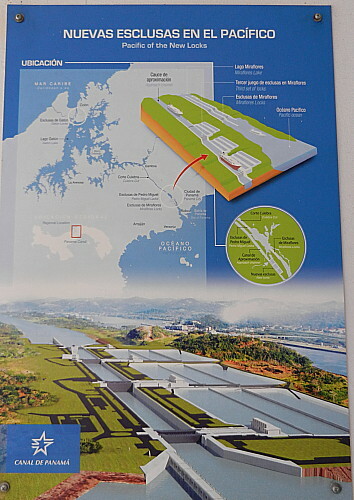 The new Canal will double capacity to handle increasing demand of worldwide travel. The new Canal, which will operate in addition to the old one, will use water-saving basins at each new lock. The present Canal is almost 100 years old and the doors are removed every 3 years for maintenance by a crane but with the new Canal that won’t be necessary because it will use more efficient rolling gates, instead of the double gates needed for pressure in the current one. Each lock chamber in the new Canal will have three water-saving basins to diminish water loss and preserve freshwater resources along the waterway by reusing water from the basins into the locks. Lengthwise the Empire state building can fit in the new Canal. 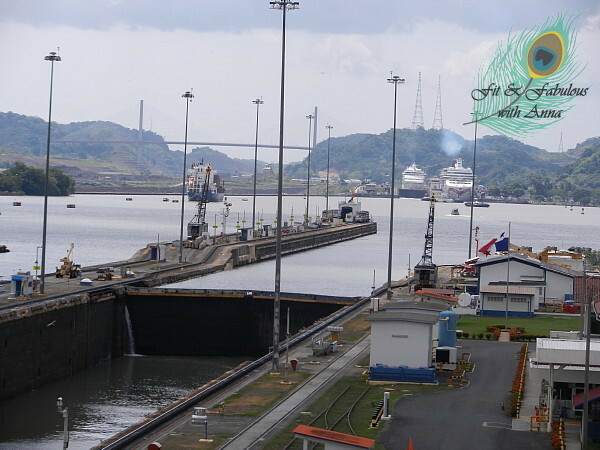 Presently the Canal uses rainwater from the Gatun Lake that accumulates during the rainy season, but that water is lost to the ocean through the locks. Gatun Lake also provides the drinking water for Panama City and Colón. Gatum Dam generates the electricity which is used to operate the locks at the Canal. 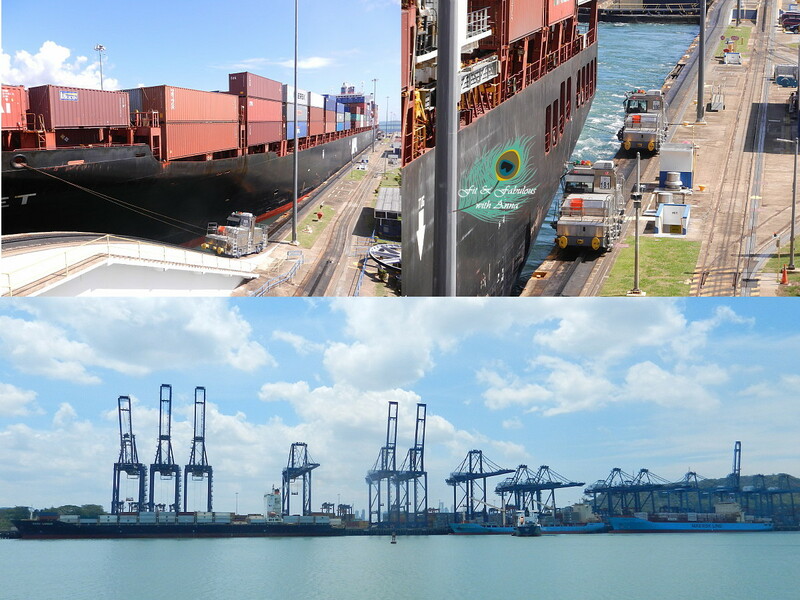 Ships pay a toll to pass through the Canal depending on either the size of the ship for passenger ships or the weight of cargo for container ships. So for instance a Norwegian Cruise Line ship with 300 pax pays $40K fare to pass through the Canal while a sailboat might only pay $800. The Panama Canal Locks are drained every 7 years to clear debris. No one can swim the Canal anymore because of crocodiles, hunting prohibited is in Panama.